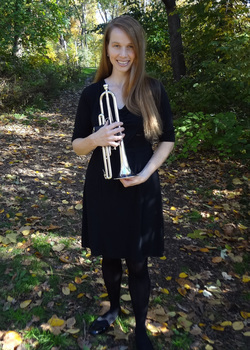 Angela Gosse has taught private trumpet lessons for 18 years. She creates a fun, encouraging atmosphere in lessons and students are given a personal practice guide every week. Her students are enthusiastic and hard-working. They excel in their band programs, and have done very well in NYSSMA auditions. Angela’s students have won auditions for LaGuardia High School of Music & Art, the Jazz at Lincoln Center Youth Orchestra, the Manhattan School of Music Prep, Metropolitan Youth Orchestra and have played in their All-County Bands and All State Bands. Angela works with each student to help them achieve their musical goals while instilling in them a love of music and of playing trumpet. "As a professional musician myself, I'm very particular about who teaches my children. There are teachers who make lessons fun, and others who set high standards, but very few who manage to do both. Angela has taught my son for five years, and has shown an uncanny knack for knowing how to inspire him to want to work hard at each stage of his development. Further, unlike so many teachers, she thinks structurally about my son’s musical development, in terms of both repertoire and the kinds of playing opportunities that he can and should be seeking here in New York City. On top of her fine musicianship and teaching ability, she is a warm, encouraging presence who truly cares about her students. You can't do better!" - P.L. "Angela as a teacher is demanding and challenging in the best possible way. She inspires and encourages, and her choice of music from both the classical and jazz repertoire has resulted in a student who wants to practice his lessons. Thank you!" B.C. "Angela has a gift for working with each child that comes to study with her. She takes time to find out what teaching strategies work for each student while not sacrificing her standards." K.B. "Our son is entering his fifth year of trumpet lessons with Angela. She has a terrific ability to combine a serious approach to practice and play with fun. She knows how to push the students toward their potential with gentle encouragement and by sharing her love of music. Trumpet lessons with Angela are a happily anticipated part of our son's week." L.L. "My son has been taking lessons with Angela for more than 2 years. She is endlessly patient while pushing him to excel further in his learning. He greatly looks forward to his weekly lesson, and is making great strides in his trumpet playing. I couldn't say enough wonderful things about Angela!" B.R. "My son has worked with Angela for almost 4 years...she has not only taught him to play the trumpet beautifully and with stage presence, but has instilled in him a love of music that will last a lifetime" J.P.